Ladies and gentleman, she's on a roll. Fleuretta Fée is always particularly strong in the warmer months, and for spring, she made a joyous statement on the ease of dressing. Yes, it can be as simple as hand-dyed fabric in multiple hues, or holographic fairy dust that dances with just a minimal amount of light. 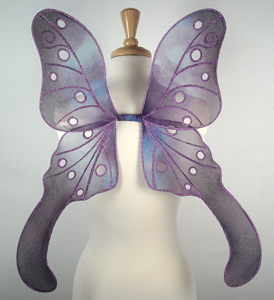 These wings are certain to add to the elegance of fairies from coast to coast.